Who knew? In the mid-1970s, foosball was a big money sport, almost on par with professional golf and tennis. They called it tournament soccer, but it was the same foosball we all know: two players at a table spin little men on rods, trying to slam a ball into a goal. Prizes included sports cars and checks with lots of zeros. Players quit their day jobs and hit the pro circuit. It rained money, and—surprise!—it didn’t last. Video games blew up and relegated foosball tables to paneled family rooms and bars. Game over? Not quite. A tiny circuit of foosball tournaments continues to nurse obsessives perfecting their pull shots. 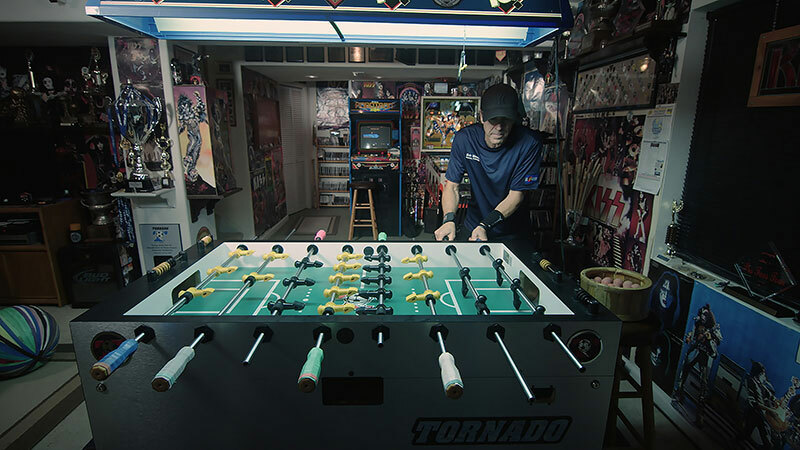 Like a Hoop Dreams from the Upside Down, the charming and often funny Foosballers tracks a handful of average-Joe fanatics in the months leading up to the Tornado World Championships—the Super Bowl of foosball—then dives into an intense, nerve-racking competition. We learn the sport’s history, trick shots, and meet legends of the game—some who still play, some who have descended into madness. Beware—this foosball thing is not for the weak-hearted.